*DIS Contributors review meals and entertainment that they have paid for during their own vacations. They only utilize discounts and offers if they are available to the general public, such as annual passholder discounts, Tables in Wonderland, or DVC membership discounts. They receive no additional compensation for dining experiences or events, so that they may give their honest opinions about price and value. The DIS Unplugged Disney Dining Show has featured “Pick Six” episodes in which one member of the team picks their top dining location at each of the four main Walt Disney World theme parks (Magic Kingdom, Epcot, Disney’s Hollywood Studios, and Animal Kingdom), Disney Springs, and at one of the resorts. I thought it would be fun to share what my family would pick as our top choices for each category given that we come at it with a bit of a different perspective: We are a collection of people rather than just an individual, that collection includes children (currently aged 10, 6, and 4), and we are not locals — we get to Walt Disney World about once a year. The picks are largely based around where we tend to return to often, which implicitly brings value into play as well. Lastly, for each category I will also list an honorable mention (or two). Let’s get started! We, of course, have to start with the Magic Kingdom — though this one was a bit tough for us as we don’t have a go-to dining location here and we seem to keep trying different places. In the end, we selected a location at which we have enjoyed both breakfast and lunch and that we feel is good value for the money: Sleepy Hollow in Liberty Square. 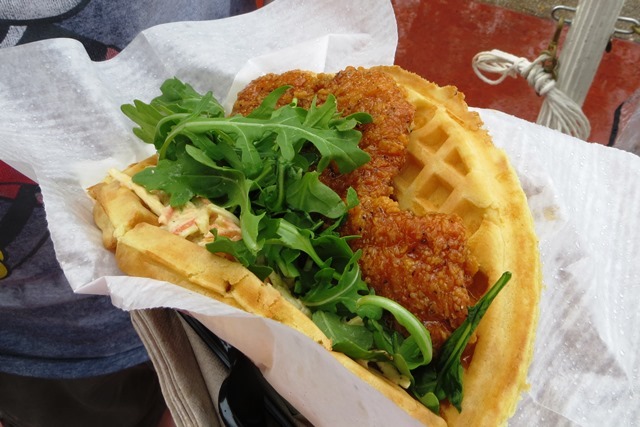 We enjoy a lot of the food items here — especially the Fresh Fruit Waffle Sandwich (served with Chocolate-Hazelnut Spread) and the Sweet and Spicy Chicken Waffle Sandwich. Both are quite large and we feel are good value. We did also liked the Coffee Ice Cream Floats that are, unfortunately, no longer on the menu. Additionally, one of our favorites spots to watch the Festival of Fantasy parade is under the portico by the Hall of Presidents and Sleepy Hollow is then a very convenient place to stop by for a snack to have while waiting for the parade to start. Honorable Mention: Jungle Navigation Co. Ltd. Skippers Canteen — We’ve only eaten there once so we were hesitant to select it. We did really enjoy our meal there and found the food to be a bit unique and some of the best within the Magic Kingdom. Additionally, the kids (well, and me) loved the shenanigans of the cast members working there. Epcot is another tricky one as there are many places there we enjoy, and we also often visit during the Food & Wine Festival and will make meals out of sampling at the different food booths. In the end, we selected one that is relatively new to us but one I know we will continue to frequent: Spice Road Table in the Morocco Pavilion within World Showcase. This is tapas-style dining and we love sharing small plates and trying different things. We also found the kids meals there to be a bit unique, but still familiar and served in a very cute style that included humus with carrot sticks and French fries, along with a beef slider or chicken kabob. A kids pasta dish is also available. One of our favorite items was the lamb sliders served with hummus fries. What we really love about the restaurant is the location and the view it provides of the nighttime show on the lagoon (currently Illuminations, though that is changing later in 2019). My wife and I really enjoyed being able to watch the show while simply sitting and relaxing — and while eating the chocolate pyramid dessert along with a glass of wine. Honorable Mention: Sunshine Seasons Food Court in the Land Pavilion in Future World — This is definitely one of our go-to quick service locations due to the variety of food offerings, the portion size, the quality, and the strawberry shortcake! The location is also great as Soarin’ Around the World and Living with the Land are two of our favorite rides and we will often utilize Sunshine Seasons while we are rider-swapping on Soarin’. While we did have a good meal at The Hollywood Brown Derby, when factoring cost and the time the meal takes, we prefer The Hollywood Brown Derby Lounge. This is the outside area next to the main restaurant and does not require an Advance Dining Reservation (ADR). The menu consists of a number of appetizers and snack-type food along with a good selection of fun drinks (with and without alcohol) including several flights, such as martinis or margaritas. You can get the famous Hollywood Brown Derby Cobb Salad here, but my choice is the Derby Sliders — that Wagu Beef slider is the best burger I have had on Disney property. You can also see the Star Wars Stage Show from this area (so that might be a pro or a con for you). Overall, we find this to be a nice choice to just sit and relax, and have a tasty bite to eat. Honorable Mention: We like to choose restaurants that are unique when we dine at Walt Disney World, and one that definitely fits this category is the Sci-Fi Dine-In Theater Restaurant. It is structured so that you are sitting in convertible cars as if you are at a drive-in movie theater and watching clips from old science fiction movies. I enjoyed our meal here but my kids found the film clips to be creepy/scary, so while I think we will return at some point, it won’t be until they are older. Animal Kingdom is one of our absolute favorite parks; the attention to detail is amazing! It also happens to be home to our favorite character meal, Tusker House, which is our dining choice for this park. We have never had a bad meal here, and I love that they have both African-inspired dishes but also more traditional American dishes so everyone in the family can find something to eat. We’ve also always had great character interactions, and it is fun to see the characters in their safari outfits! Our favorite meal there is breakfast — especially if we can secure a pre-park opening ADR which allows us to experience a near-empty park and the opportunity for some great family photos in front of the Tree of Life with no other people around. Honorable Mention: Satu’li Canteen in Pandora: The World of Avatar. In my opinion, this is the best quick service on property. The unique (and healthy) options with the bowls are a nice change of pace and the cheeseburger pods are really good! Just stay away from the Dreamwalker Sangria — I did not enjoy that at all! There are so many restaurants — and so many new restaurants — at Disney Springs that it is hard to pick a favorite. But the one we can’t bring ourselves to not select is Morimoto Asia. We had one of my absolute favorite meals ever there, and it was because of so many reasons. First, the food is excellent; the Rock Shrimp Tempura appetizer and Morimoto Peking Duck (for two) entree truly stand out. Second, the kids meals are great and so much fun! They come with these neat fork/chopstick combination tools for them and also origami sheets to keep them busy. They also come with a boba tea and dessert; all for $12 which I think is pretty good. Third, the space itself is just beautiful and unique. Lastly, we had the best server we have ever had at Walt Disney World who just took care of us, and especially, the kids. While there are lots of options at Disney Springs, if you like Asian food at all I definitely suggest you check this place out. They also have a to-go counter called Morimoto Asia Street Food if you want to try a quicker, cheaper option. Honorable Mention: I couldn’t pick just one, but will limit myself to two: Raglan Road has long been a favorite of ours — especially the appetizers. They also have a rather good beer menu (specifically by the bottle) and while it might be heresy to say, I actually prefer their bread pudding over ‘Ohana’s. Chef Art Smith’s Homecomin’ is another of our favorites due to the tasty food and very inviting setting. We’ve enjoyed both lunch and brunch there. There are definitely a lot of options when it comes to resort dining, but one that we will go out of our way to visit is Sanaa in the Kidani Village section of the Animal Kingdom Lodge. 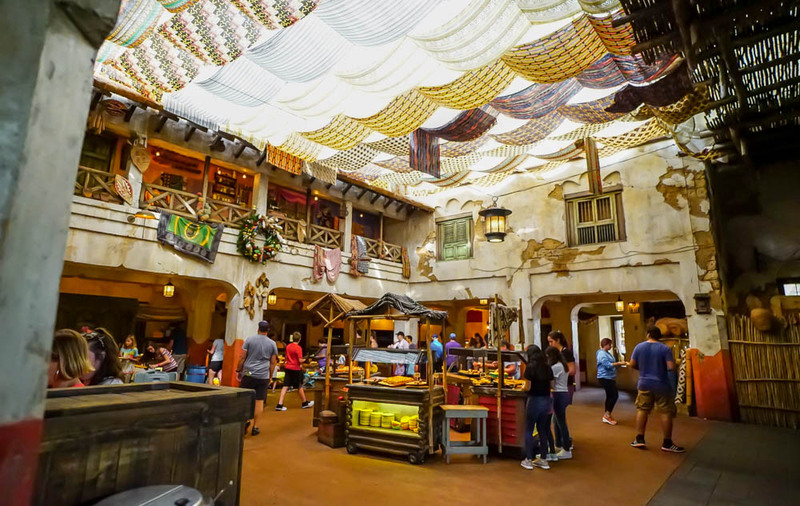 This is a restaurant we frequent for lunch during our Animal Kingdom day as it provides a really nice break from the heat and is something we look forward to due to the food, but also the location. The ability to overlook the Sunset Savannah and see the animals while you dine is such a fun and unique opportunity. 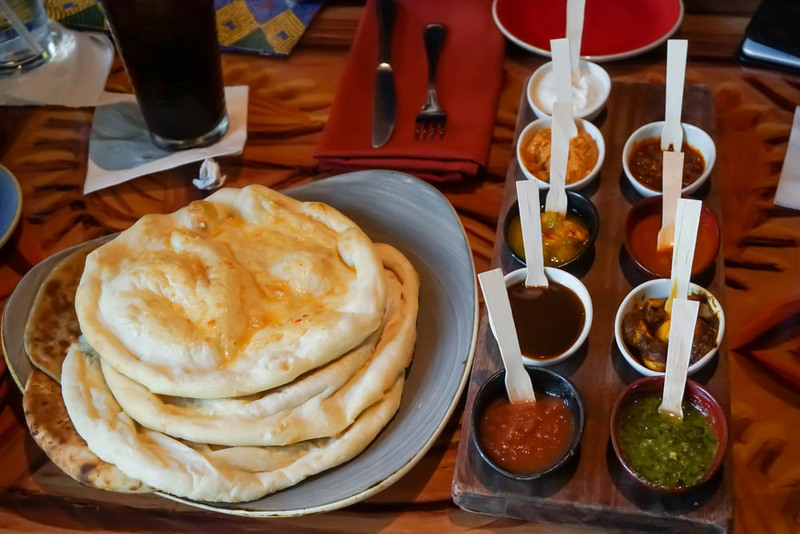 A must-do item at Sanaa is the Indian-style Bread Service with all Nine Accompaniments — just a great shareable item and it’s fun to try the different combination of breads with sauces and other items. The Potjie Inspired entree let’s you pick two items — one from the Journey (which is a protein option) and one from the Harvest (a vegetable based item) served with rice — and is another great way to try different things. They also have a really great drink menu and a number of great options on the kids menu. Honorable Mention: Again, there are several I could pick, but one other family favorite (though due to price point we don’t do every trip) is California Grill at the Contemporary Resort. There are so many good things on that menu — from sushi to flatbreads to amazing pork and beef entrees — it’s hard to not have a good meal there. When you add in the view, especially during fireworks, it is hard to beat it as a Disney dining experience. 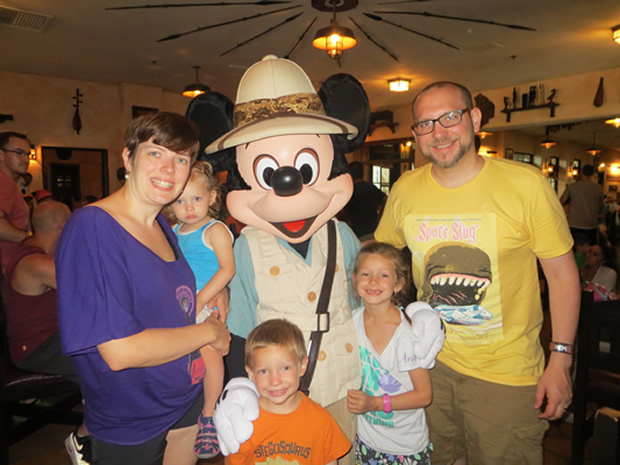 Dining is always a big part of any of our vacations, but especially Disney-related ones. Hope that you enjoyed reading about our “Pick Six” choices and hope that it highlighted a couple of new options for you to consider. Happy Dining!